Each spring, the cherry blossoms at the Tidal Basin in Washington, D.C., draw in hundreds of thousands of visitors trying to catch the pink petals at peak bloom. Climate change could have an impact on future visitors' plans. Over the last century, temperatures have shifted peak bloom — defined as when 70 percent of Yoshino cherry blossoms are open — approximately five days earlier since 1921, according to the Environmental Protection Agency. A National Park Service climate change scientist determined that climate change has increased the temperatures around the tidal basin at a rate of about 1.1 degrees Celsius per century (a rate of about 2 degrees Fahrenheit), park service spokesman Mike Litterst said. “That’s a statistically significant rate,” Litterst said. Higher daily temperatures make peak blooms arrive sooner, and the long-term trend shows earlier and earlier blooming, he said. 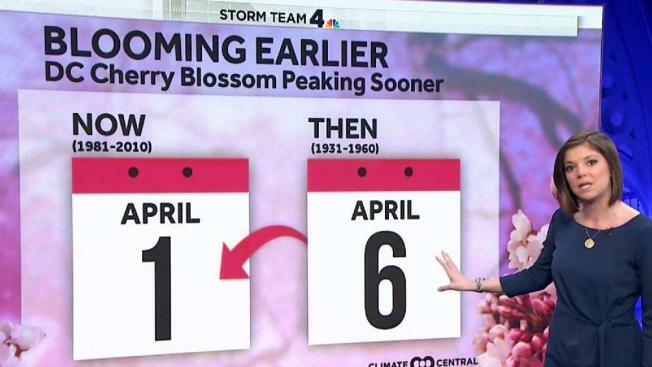 When people plan their visits months in advance to see the trees in bloom, they look at climate data for when they would typically see peak bloom, NBC Washington meteorologist Amelia Draper noted. But day-to-day temperatures ultimately determine when peak bloom happens on a given year, she said. “The cherry blossoms are a great example of the difference between weather and climate,” Draper said. Freezes are also detrimental to the cherry blossoms and climate trends are a factor there as well, Draper said. A cold snap killed off half the blossoms that were set to bloom in March 2017. One of the concerns about the shift to earlier bloom dates is that it puts the cherry blossoms at more of a risk to a late season frost or snow, as happened in 2017, Litterst said. Peak bloom arrived April 1 this year, the park service said. Warming temperatures are not the only problem the Tidal Basin area faces, with more frequent high tide flooding and a sea wall that’s dropping by about an inch or so each year, Litterst said. The wall is sinking because its original timber pilings were not placed on bedrock when installed in the 1930s, according to the park service. Tides undermine that infrastructure, too, Litterst said. There are places where, at high tide, it’s almost guaranteed that water is up over the wall, covering a segment of the park’s sidewalk and roots of some trees. Over the long term, the District could see sea level rise of about 2 feet by 2100, according to Climate Central, which analyzed projections from the National Oceanic and Atmospheric Administration. This puts the area at a 60 percent risk of seeing at least one flood over 8 feet in the next 50 years, according to Climate Central. Cherry blossoms arrived in Washington as a gift from Japan in 1912 as a symbol of friendship between the United States and Japan, according to the park service. First lady Helen Taft and Viscountess Iwa Chinda, wife of the Japanese ambassador, planted the first two trees along the Tidal Basin on March 27, 1912. In Kyoto, Japan, which is about the same distance from the equator as Washington, D.C., cherry blossoms have also seen a shift toward earlier blooming due to warmer temperatures over time, according to research by Yasuyuki Aono, a professor of environmental sciences at Osaka Prefecture University. Aono was able to estimate peak blooms for about the past 1,200 years. The National Cherry Blossom Festival, which brings some 1.5 million visitors each year is now underway and will run until April 14. The festival is a “launching pad” for tourism season, when it’s also peak convention season and Congress is in session, said Elliot Ferguson, president and CEO of Destination DC, which handles tourism outreach and programming for the area. "I think people would still want to come to D.C. during the peak blooming season,” Ferguson said of unpredictable bloom periods. “There are a lot of things to do in the region. The goal for us is to influence potential travelers coming to Washington to come for four days instead of one or two." Beyond blooming season, the festival itself, which lasts three to four weeks, also influences travelers’ decisions, he said.